I guess I have an affinity for lizards….mmmm…….no I don’t, but I do love the Geico Geco and Lowe’s Valspar Chameleon. I just love to watch the commercial and see the lizard change colors to match his paint cans. And THAT’S what I love about paint; that and it’s cheap!….for the result you get. If you want to do stripes, DO IT! Start in a closet if you’re a chicken J. TIP: I’ll tell you a secret. Back many years ago while on a very tight budget I bought some paint from WalMart. It was very good paint. Not nearly Valspar quality, but still good paint and a fraction of the cost. And you know what else is great about paint? If you don’t like it, paint over it. Simple as that. 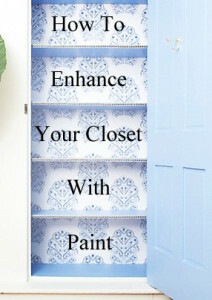 Consider painting the inside of a closet a bright, bold color. How fun to be met with a cheery surprise when you hang up your coat. What about your pantry? 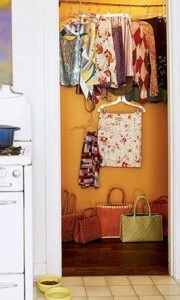 What a great closet to paint bright yellow. Purple or pink or lime green inside a little girl’s closet? Orange and blue inside the little boy’s? Brown and turquoise inside the bathroom linen closet? Toy closet? All kinds of possibilities there. I would love to do this to either a closet or a reading corner of a child’s room. Throw some brightly colored throw pillows on the floor, a cool rug, and a set of book shelves and you’ve got a darling modern library for the little ones or a teenager. HECK! 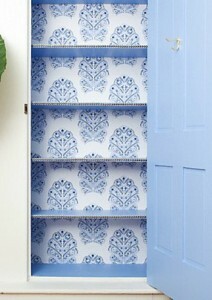 I would LOVE this in a craft or hobby room, right? Following are some more pics for you chameleon closet painters out there!